Well, it’s been raining here all day and it’s just so damn depressing (yes, even with the few rays of sun that shine through the clouds every so often). And, what is more cheerful that party food! 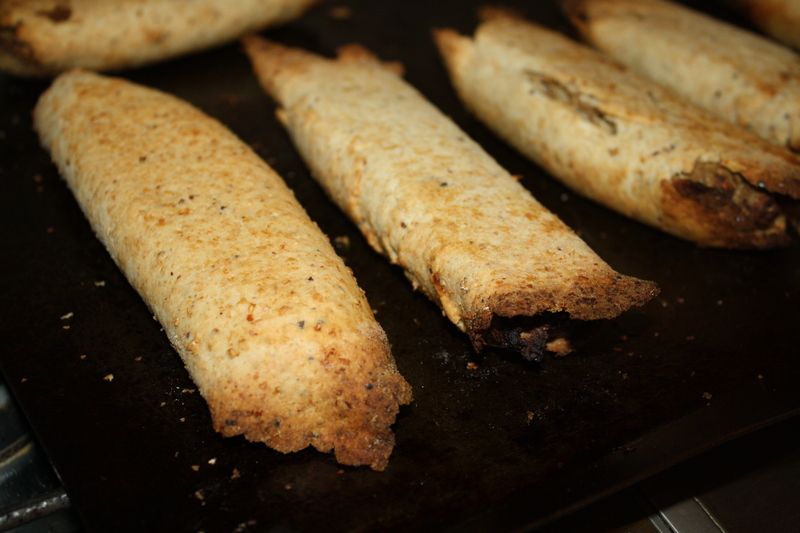 So, here are some wonderful ‘sausage’ rolls – great for packed lunches and picnics too! 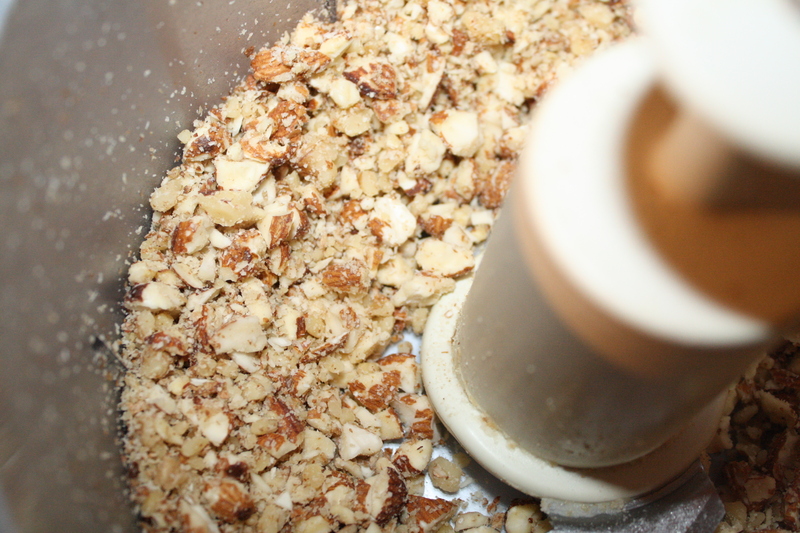 Put the nuts into a food processor and wizz up until in small chunks (if you want the mix more nutty, leave the nut-chunks bigger, if you want it smooth, make them smaller). Put in the tofu in large cubes and blend until combined. Add the onion (sectioned into 8 chunks) and the asparagus and wizz until they are combined in. Then add the nutritional yeast, soy sauce and syrup and begin wizzing those in, while slowly pouring the water into the mix. Spread the mix out onto pastry sheets and roll – brush the pastry with a little bit of non-dairy milk! Bake in a pre-heated 180-200 degree oven for about 20 minutes, turning over for the final five, or until pastry is golden. This recipe only makes a very small batch. Maybe 5 or 6 balls depending how big you roll them out. This is meant to just be a sweet-tooth quencher or a for those times you really feel like something delicious with your tea and there are no biscuits in the entire house. Mix all the dry in a small bowl, slowly add the syrup until the mix is just combined enough, roll into balls, eat. Of course there are many, many wonderful vegan cheesecake recipes out there, including this no-bake Lemon Cheesecake from Animal Liberation Victoria‘s Vegan Easy. But this is my baked cinnamon ‘cheesecake’ which is S approved. I use the same pastry as I use for everything. The recipe is here. When using the pastry for sweet things, feel free to add a teaspoon of vanilla essence, or a few teaspoons of sugar. I don’t because I don’t really have too much of a sweet tooth. As you can see, I used a muffin pan to make individual serve ‘cheesecake’s, but you can easily use this to make a pie-sized cake. 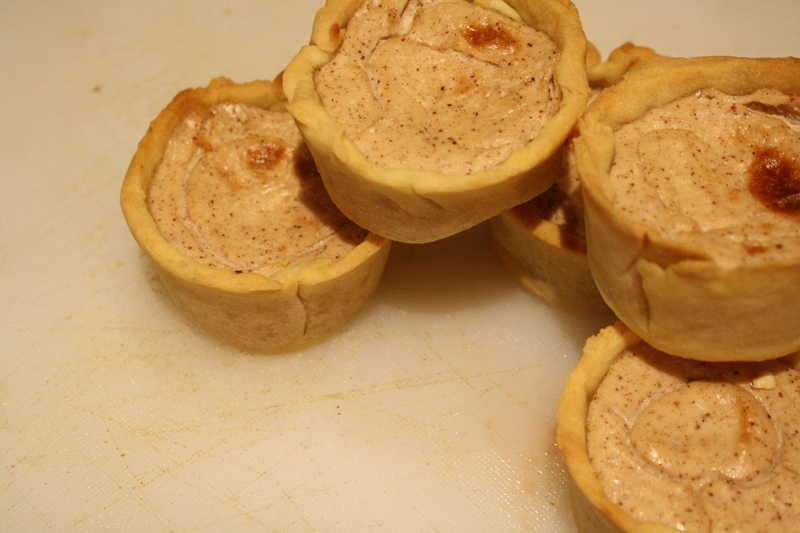 Whichever you decide, blind bake the pie cases (either 6 individual or 1 full-sized) until almost golden brown. While the case is in the oven prepare the filling. Keep the oven on at about 180 C.
In a food processor, blend up the Tofutti Better than Cream Cheese and the tofu, until you have a very smooth mixture. Add the cinnamon, ginger and nutmeg and continue blending – add more spice if you like. Some tofus naturally make a sweeter mixture than others so add sugar only if you think the mix needs it. Blend again. Once the case(s) come out of the oven, spoon the mixture in and pop back in the oven and bake for about 15 minutes, until the top is slightly browned. When first out of the oven, the cheesecake will seem a little too wet – but it will firm up as it cools down. Serve alone, or with a spoonful of a dairy-free vanilla icecream. My special occasion variation on this is making the pie casing out of gingerbread instead of pastry: delicious! 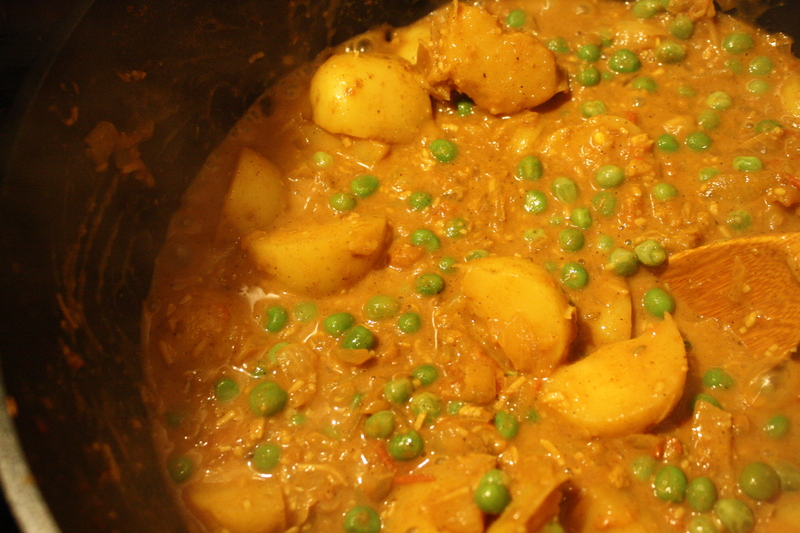 On another note, I’m halfway through a Green Peas and Potato Masala (as I spoke about over here.) It’s been kind of an experiment, so hopefully it works out well. When the kinks are worked out, I’ll post the finished recipe. Seriously: who doesn’t love cupcakes?!? The truly wonderful thing about cupcakes is the simple fact that you can do so much with them! I don’t really want to say too much about cupcakes in general, especially as a vegan chef recent won Cupcake Wars (on the Food Network in the US). The winner, Chloe Coscarelli, also has a bunch of amazing looking recipes on her blog – including some of the winning cupcake recipes. 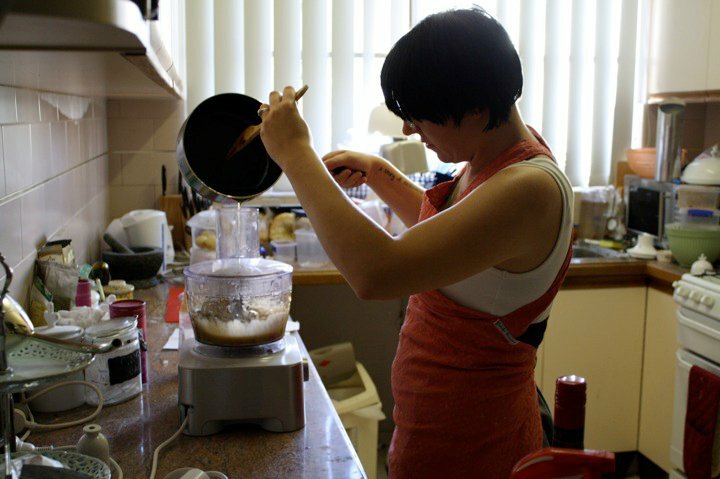 My personal cupcake procedure includes making a huge batch of vanilla cake batter, then changing the batter after each pan of 6 cupcakes: the first are always vanilla, and then cookies, or chocolate, or nuts or other flavours and colours get added to each pan. Depending how detailed you want to get it requires a bit of organisation: otherwise you end up with a delicious rhubarb and apple muffin batter when you really wanted to make a pan of chocolate next. Yesterday, I was pretty boring, honestly. I made vanilla, vanilla and raspberry and chocolate. 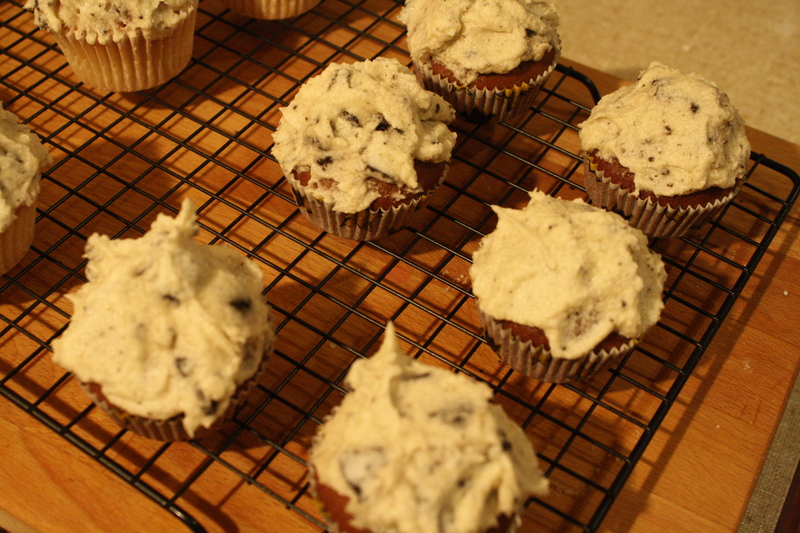 The vanilla and chocolate cuppies were iced with a vanilla and crushed-Oreo ‘butter’cream icing. Preheat oven to 180 C. Lightly oil cupcake pans, or line with cases. In a large bowl, combine flour, sugar, baking soda, salt. Create a well in the center and add milk, oil, vinegar, and vanilla, and mix until thoroughly combined. Let cake cool about 10 minutes, then run a knife around the edge to loosen cakes from the side. Invert the cakes onto a plate and re-invert onto a cooling rack. Let the cake cool completely. 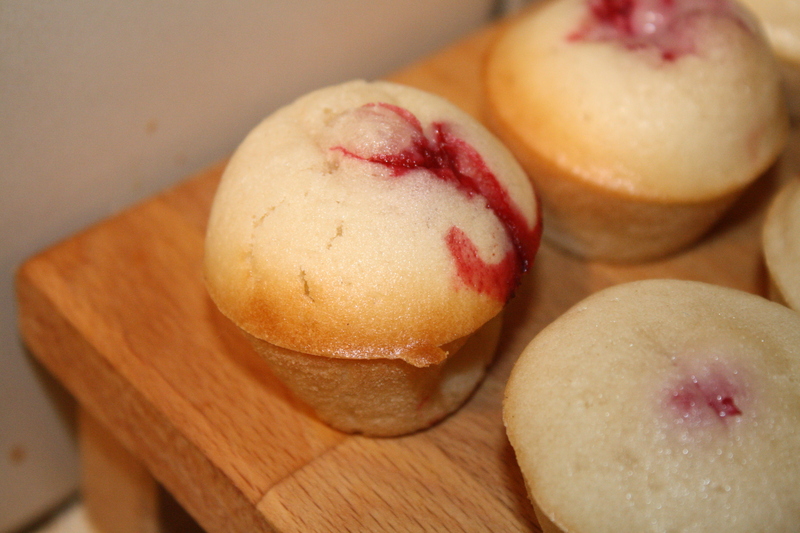 The raspberry bites are so easy, and work especially well in tiny cupcake pans. I have only recently started eating raspberry, and I’m not really sure why because it’s so good! This uses the plain vanilla mix, fill the mini pans half full, put in a big raspberry and fill up the rest of the pan. Hey presto: a tiny delicious snack that makes you feel as though you’re eating something healthy. The raspberries should rise slightly during the cooking, and just break though the top. I think because I make the vast majority of S and my food from scratch I have a bizarre notion that what I am making is healthy. But it’s not. Well, not always. So, I’m trying to be healthier. Not in the least because S is training to run a marathon, and therefore I am frantically searching for an easily adaptable training meal plan for him that isn’t going to make me stack on the weight, I’m also trying to lose weight. I have no intention of letting my MA thesis add another ten kilos to the ten honours-thesis kilos I’m currently trying to shift! I used the Angel Foods Vegan Marshmallow Kit, after a disastrous attempt at another recipe a while ago. I’m going to keep up the hunt for a good made-from-scratch recipe, though. And I’d like to have a go at the Meringue Cookies, as well. While these are delicious (though super-sweet!) they aren’t like I remember marshmallows to be. Though, it’s been a long time since I’ve had ‘real’ marshmallows anyway. Ideally, I’d like something a bit lighter and fluffier than these. Having said that, I think they would have turned out better if I had beaten them with my electric mixer, rather than using the whisk in the food processor. 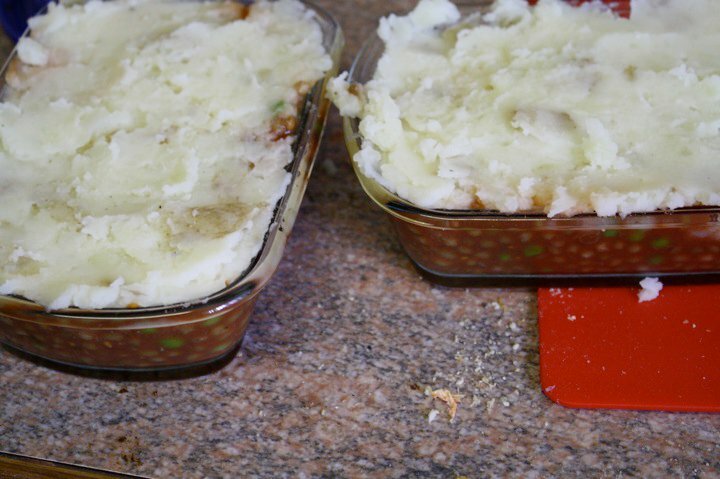 At the time, though, I was making individual Lentil Cottage Pies for S and I to have for lunch, and Snobby Joes (from the Veganomicon) for dinner; so I wanted to be able to leave the marshmallows to whip on their own. Cook up about 3/4 cup of brown lentils. While that’s simmering away, throw 4-5 small potatoes in the steamer (or on to boil), and brown 1/2 diced onion, 1/4 leek and some garlic (to taste). When the lentils are done, drain really well and put them back in the saucepan. Add the onion-leek-garlic mix, some peas (and mushrooms if you like) a tin of crushed tomatoes and some oregano. Let all that simmer away for another ten minutes or so, then pour into dishes (individual ramekins or a casserole dish). When the potatoes are ready, mash them however it is you normally mash them – I personally like it with not much rice milk, a teaspoon of Nuttelex and pepper. I usually do this while the lentil mix is simmering away. Then, scoop the mash on top of the lentil mix. It’s also quite good with sweet potato mash. To eat right away, pop it in the oven to let the top crisp up a bit. A quick potato-mashing hint: Work while the potato is still boiling hot, and wait until you’re potato is well and truly mashed up before adding rice/soy milk, Nuttelex, salt, pepper or anything you might add. You’ll get smoother, creamier mash!